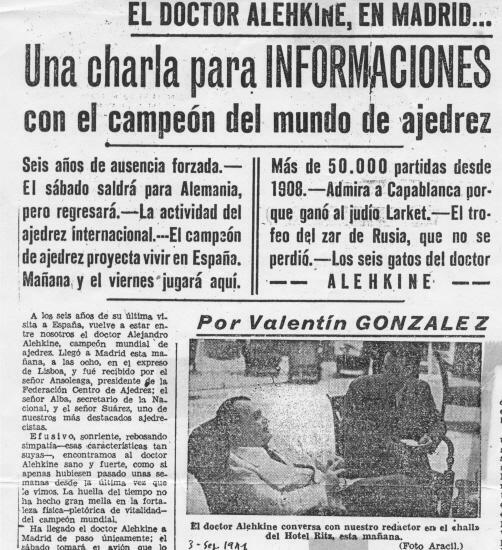 ‘At eight o’clock this morning the world champion Dr Alekhine arrived in Madrid from Lisbon and on his way to Munich, where he will take part in the International Chess Tournament which begins next Monday. He was welcomed at the Delicias station by Mr Ansoleaga (President of the Regional Federation), Mr Alba (Secretary of the National Federation, who was representing its President, Mr Fernández Balbuena, who was unavailable), Mr Rodríguez Suárez, and representatives of the press. Alekhine immediately went to his hotel, the Ritz. To take advantage of his stay in our capital there will be two exhibitions by the champion. The first will be tomorrow at the Madrid F.C. and will be a display of eight or ten games with clocks. The second will be on Friday at the Casino de Madrid, where he will probably play 30 games simultaneously. He intends to leave for Munich on Saturday. Dr Alekhine kindly granted us an interview in the foyer of the Ritz Hotel, and his pleasant, friendly conversation covered many most interesting chess topics. Referring to the tournament in which he is going to participate, he told us that there would be 16 players from various countries: Hungary, Sweden, Holland, Switzerland, etc. He did not have the names of those who had entered, but he said he had read that the Swiss Grob would be participating, as well as Junge and Schmidt, the latter currently being considered German. He also thought it probable that Euwe and Bogoljubow would be playing. We discussed world chess, and he told us that there was a certain amount of activity in South America at present. This was mainly in Argentina and Brazil, where chess was becoming active owing to the Rio de Janeiro Automobile Club, which was interested in the game and intended to organize a major tournament. We asked him about European chess magazines published today, and he mentioned the German and English ones; in France at the moment there is no magazine, and about Holland he knew nothing. He added that in the German magazine Deutsche Schachzeitung and the German daily Pariser Zeitung, currently published in Paris, he had been the first to deal with chess from the racial point of view. In these articles, he said, he wrote that Aryan chess was aggressive chess, that he considered defence solely to be the consequence of earlier error, and that, on the other hand, the Semitic concept admitted the idea of pure defence, believing it legitimate to win in this way. With regard to the world championship, he replied to us that it was very difficult to imagine that a match could be held before the end of the War. In this connection the names of various players were mentioned, and he told us who were the most outstanding younger players; he was particularly watching Keres, Eliskases and a few others, with whom battles would be interesting. “What are your plans after the Munich Tournament?”, we asked. “And what about the possibility, of which there is talk, that you will settle in Spain?”, we enquired again. “What are your plans?”, we asked. As we said farewell, we spoke about several famous international players, and he told us that he supposed the Soviets would have mobilized Keres, Mikenas and Petrov, although they were not subjects of Russia but of small countries of which the USSR had taken possession; he believed that Lilienthal and Flohr were in Moscow because they had chosen to become Soviet citizens. Many other topics were discussed, but we have to omit them. The above should be sufficient to satisfy the curiosity aroused in enthusiasts by the arrival of the leading figure in world chess. After extending to him a most warm welcome, we expressed the hope that his stay in Madrid would be pleasant and, even more, that he would indeed return and remain with us, so that we could reap the fruit of his lessons. ‘Six years after his last visit to Spain, the world chess champion Dr Alexander Alekhine has returned. He arrived in Madrid at eight o’clock this morning on the express from Lisbon, and was welcomed by Mr Ansoleaga (President of the Federación Centro de Ajedrez), Mr Alba (Secretary of the National Federation), and Mr Suárez, one of our leading players. Effusive, smiling, brimming over with kindness – which is so characteristic of him – Dr Alekhine looked healthy and strong when we met him; it was as though hardly a few weeks had passed since we last saw him. Time has done little harm to the world champion’s physical strength, and he is full of vitality. 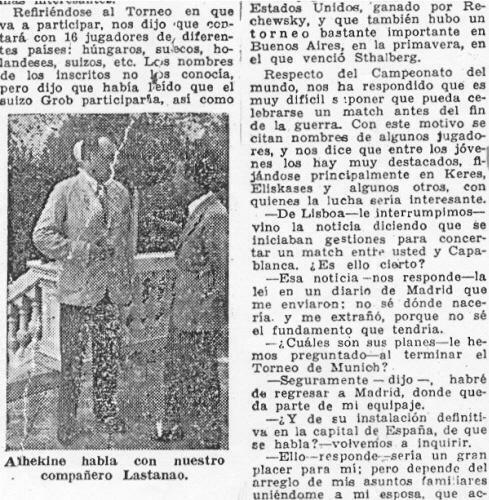 Dr Alekhine is only passing through Madrid. On Saturday he will catch an aeroplane for Germany; in Munich he will participate in a 16-player tournament. With the arrival of such an illustrious figure in our capital we naturally had a conversation with him for the readers of Informaciones. Below are some of the declarations made by Dr Alekhine, world chess champion, to our newspaper. How is the state of world chess? Do you intend to play in Spain? What will your promised lectures be about? The Portuguese press has spoken of negotiations for a meeting between you and Capablanca. Is that true? How many games have you played in your life? Do you ever spend a day without playing? Who is the player you most admire? Which victories have given you most pleasure? Have you known good female players? Dr Alekhine must have been tired after his journey. His kindness prevented him from thinking about rest, and he received us with delightful chivalry. We continued talking until Goodness knows when; he is indefatigable. But basic courtesy suggested to us that we should “withdraw”. During the days he is spending in Madrid we shall have the opportunity to speak further of the world champion, in the context of the games he is to play at the Casino de Madrid. See also Was Alekhine a Nazi?